Your impressive biceps and forearms, built up over years of playing Wii Sports and speed-eating Doritos, can now be used for something even more entertaining: playing video games hands-free. Instructables user Brian Kaminski posted this fascinating project designed by his company, Advancer Technologies. It uses muscle sensors in place of a Nintendo controller to navigate through a level of Super Mario Bros 3. Four muscles – left and right forearm and left and right bicep – and their combinations are used to perform the basic functions in the game. 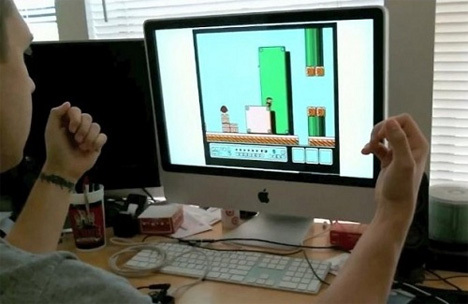 By tensing the appropriate muscles at the appropriate times, a player can guide Mario through the game with no need for hands at all. The fun biofeedback project only requires basic tech know-how but is pretty impressive when you see it in action.